John Spears (14 points) caught in the air with 6-8 defender Jacquil Taylor looking to block. 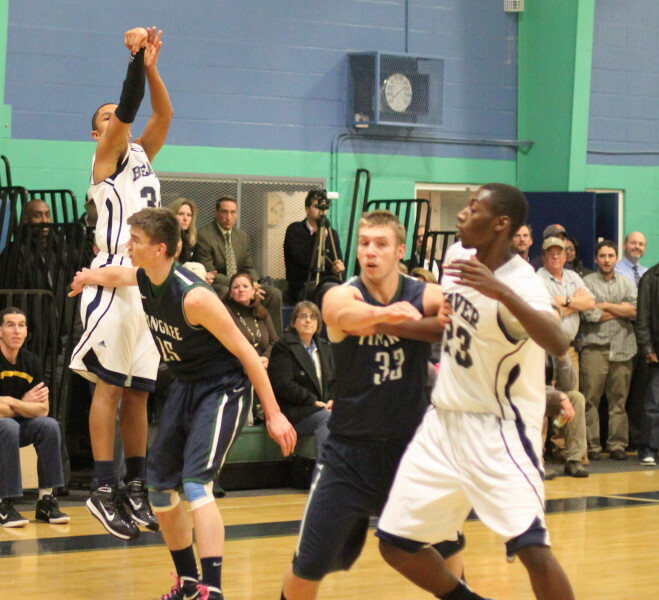 (Hamilton) The Pingree boys played a terrific half of basketball against Beaver Country Day School. Unfortunately, for the Highlanders, there was the other half. 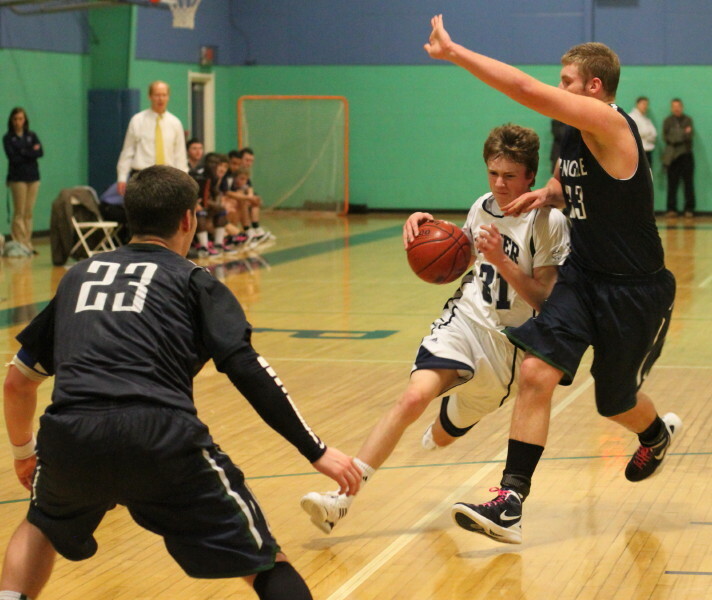 Beaver defeated Pingree, 54-36, on Wednesday afternoon in Eastern Independent League boys basketball action. This was a one point game at halftime (27-26) with the final outcome far from certain. 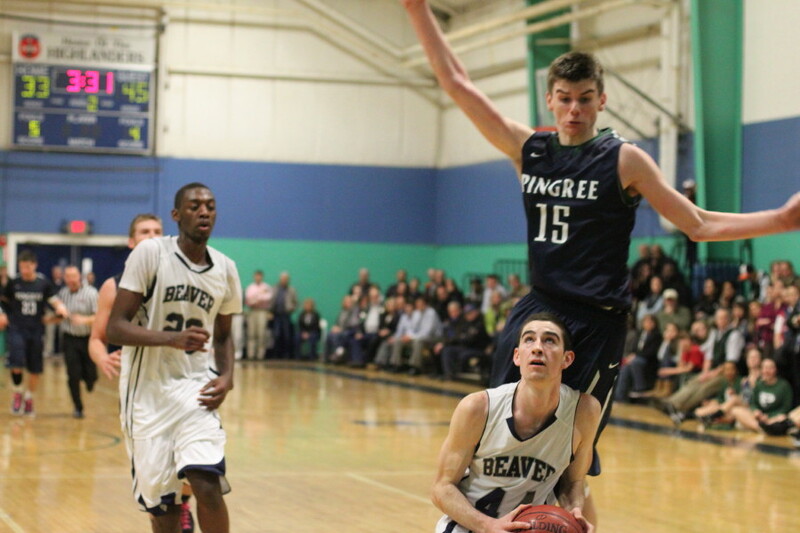 Beaver had beaten Pingree (65-41 on February 1st) so you figured that they might get stronger in the second half. 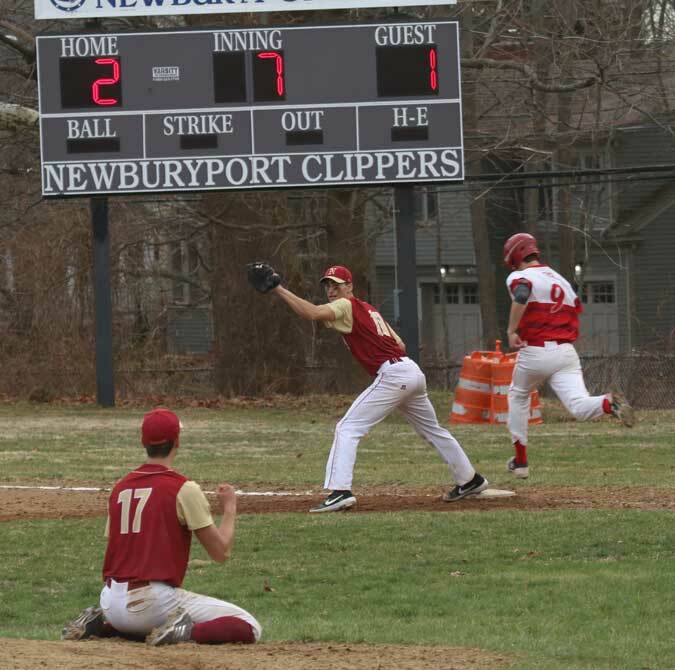 Tied at 30-30, the visitors from Chestnut Hill displayed why they came in 18-2 and undefeated (11-0) in the EIL. 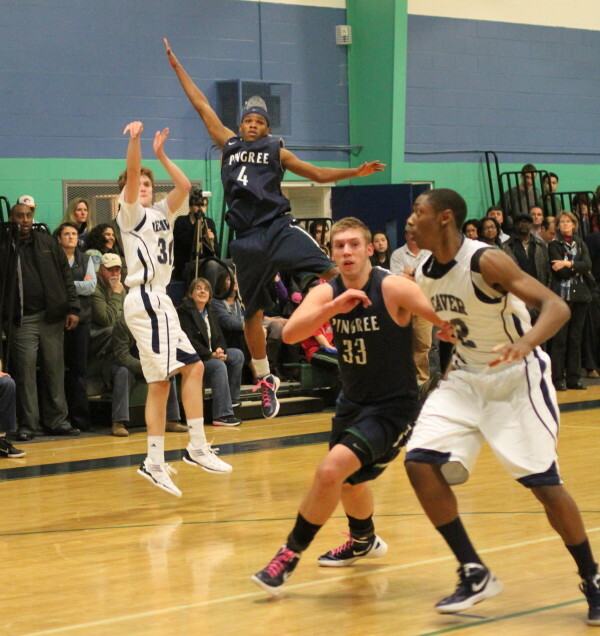 They went on an impressive 13-0 run over the next 7 1/2 minutes and Pingree never recovered. The Beaver 2-3 zone, with 6-6 Maurice Taylor and his 6-8 brother Jacquil on the inside, limited Pingree to long range attempts. That defense was less of a problem in the first half when Pingree connected on four triples. During the six minute drought the long ones weren’t falling. Meanwhile, Beaver registered points from Jacquil Taylor (dunk on a rebound), Joe Connelly (a layup and two jumpers), and Jeff Spellman (a layup and an old-fashioned 3-pont play) to pull away 43-30 and have needed separation with 8:40 left. A Brendon Ashe triple narrowed the gap to 45-36 in the last three minutes but Beaver answered with a Jacquil hook in the lane and seven free throws to close out the scoring. Exciting John Spears (14 points) had steals, assists, darts to the basket, and a triple and led the Highlanders to the front, 24-17, with five minutes left in the first half. The sophomore’s knack of getting open among players much taller than he is was very entertaining to the overflow home crowd. However, the interior of the Beaver defense did a much better job protecting the inside after halftime. If John got by one shot blocker there was quickly another one ready to show some tall defense. Unable to get open space to the rim, John was held to just two points in the second half. 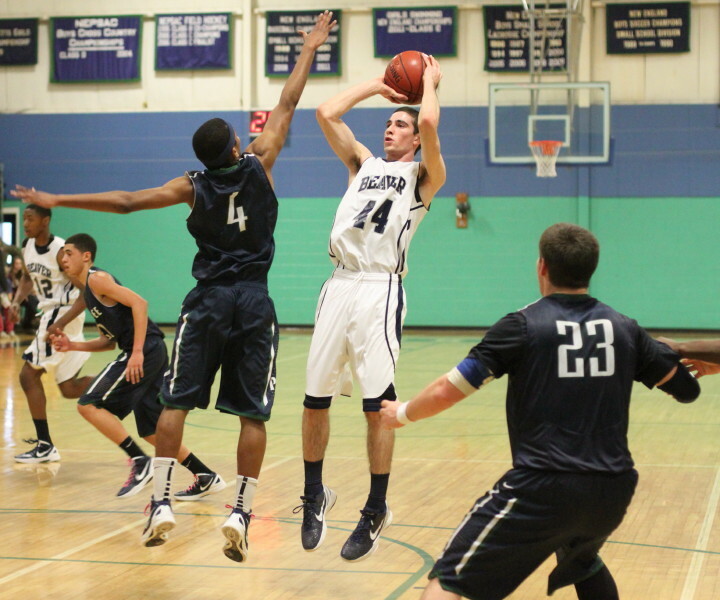 Junior Jeff Spellman (15 points) led all scorers. He proved to be more than capable of handling some very tight defensive pressure as the primary ball-handler for Beaver. Joe Connelly tallied eleven of his fourteen points in the second half getting six in the surge that broke this game wide open. The highlight I took away from his game was his hustle in running down a streaking John Spears in the second half and blocking the speedster’s layup attempt. Maurice Taylor led Beaver with ten rebounds while Isaac Carp grabbed twelve for the Highlanders. Beaver is now 19-2 overall and 12-0 in the EIL with two more league games left. Don’t bet against them going undefeated. They have won the EIL the past two seasons. Their losses were to St. Mark’s and Brooks. 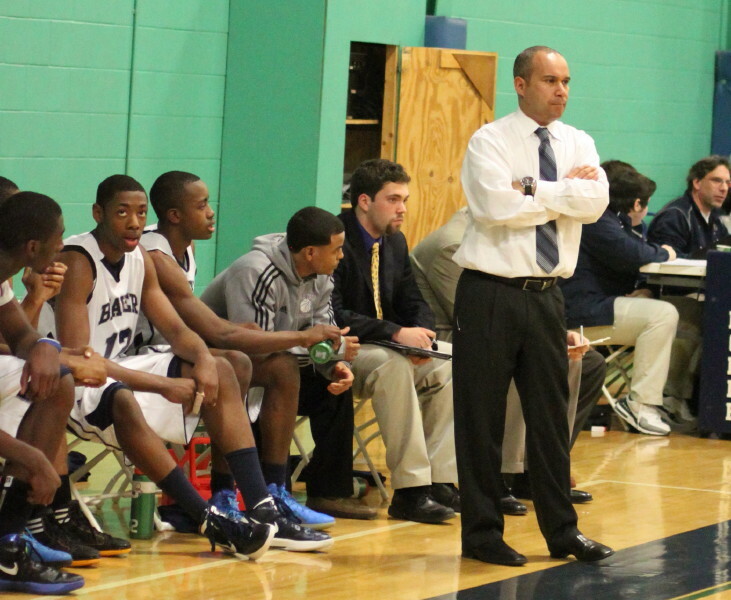 Brooks is a team they could face in the NEPSAC Division B tournament late in February. Beaver has won nine in a row and are 10-0 on the road. I did not see high-scoring Jherson Colon and assume that the Beaver guard re-injured himself. Pingree is 15-6 overall and 10-2 in the EIL. They have won nine of their last eleven games. 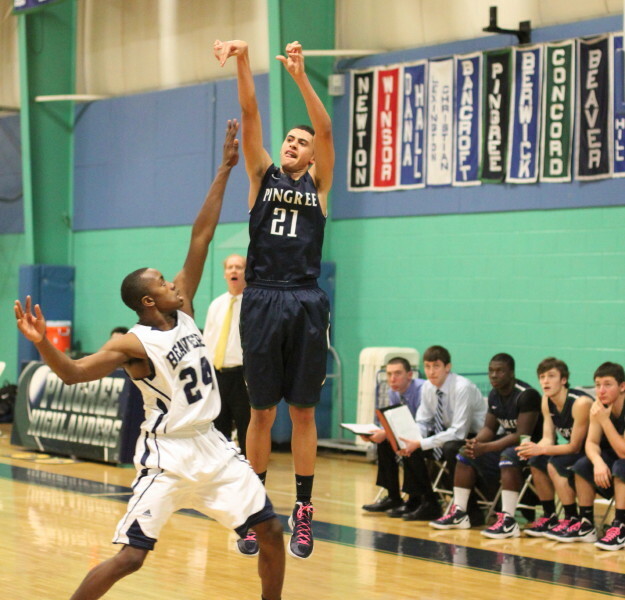 The Highlanders have three games left starting with a home matchup with Wheeler School (RI) on Friday. The other two games are EIL games. 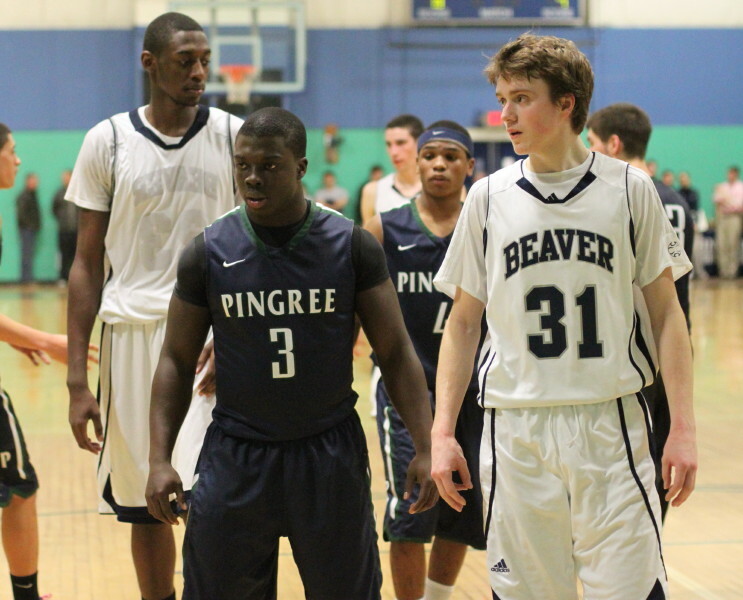 It would not surprise me to see Pingree face Beaver again in the EIL tourney final. That tournament starts on February 25th. 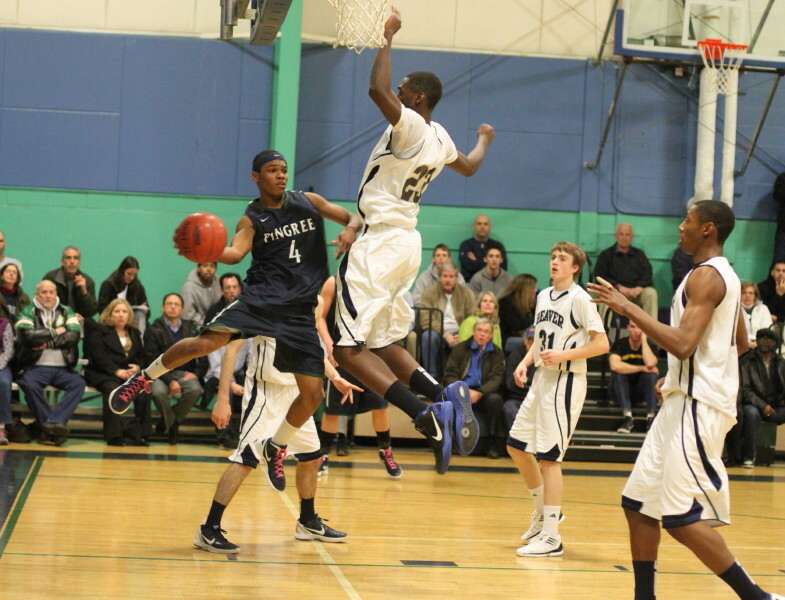 After that tournament, Pingree will be competing in Division C of the NEPSAC tourney. I’m sure that they will be happy to get away from Beaver. Joe Connelly eyes shot. Connor Reardon eyes block. Jeff Spellman gets off shot with John Spears defending.